The February 27 shock reportedly originated about 230 km north of the source region of the magnitude 9.5 earthquake of May, 1960 – the largest earthquake worldwide in the last 200 years or more. The 1960 Chilean Tsunami occurred in the aftermath of that 9.5 earthquake in Chile and spawned a tsunami that engulfed the Pacific Ocean. a subduction zone along the coast of Chile. From Chile the tsunami radiated outward, killing 61 people in Hawaii and 122 in Japan. The 1960 Chile earthquake ruptured a fault zone along which a slab of sea floor is descending, or “subducting,” beneath the adjacent South American Continent. Such “subduction zones” are formed where two of the tectonic plates that make up the Earth’s outer shell meet. Earthquakes occur when the fault ruptures, suddenly releasing built-up energy. 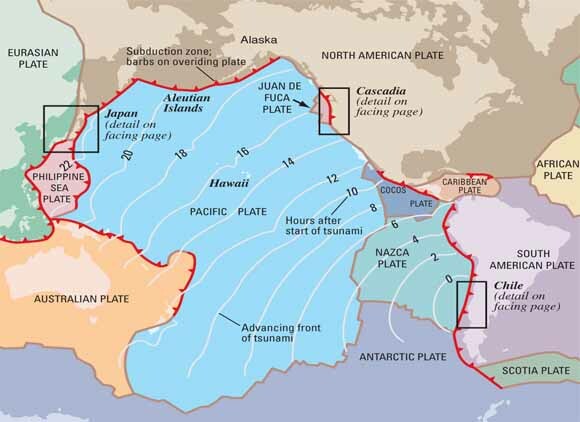 During the 1960 Chile earthquake, the western margin of the South American Plate lurched as much as 60 feet relative to the subducting Nazca Plate, in an area 600 miles long and more than 100 miles wide. A Tsunami Advisory is currently in effect ( #12 issued 02/27/2010 at 9:58AM PST) which includes the coastal areas of California, Oregon, Washington, British Columbia and Alaska from the California-Mexico border to Attu, Alaska. On Saturday, February 27, 2010 at 3:34 a.m. local time, an earthquake with a magnitude of 8.8 on the Richter Scale was recorded off the central Chilean coast. The epicenter was approximately 70 miles northeast of the city of Concepcion, about 200 miles south of Santiago. Chile is a one of the most seismically active countries in the world – earthquakes here are not uncommon. Building construction standards reflect that, but damage is being reported – ranging from light to moderate in Santiago to more severe structural damage closer to the epicenter. The U.S. Embassy in Santiago is working actively to ascertain the whereabouts of U.S. citizens, both official and unofficial — through our warden network — and local Embassy staff. No Embassy casualties have been reported at this time. American citizens in the United States seeking information on whereabouts of U.S citizens in Chile may call the U.S. State Department in Washington, D.C. at 1-888-407-4747. American citizens in Chile may call 56-2-330-3476. We have reached out to the Government of Chile and stand ready to provide assistance as requested. We extend our heartfelt condolences and prayers to the people and residents of Chile who are confronted with this disaster. You might want to check the USGS: World Earthquake Information by Country/Region. Knowing what to do to prepare for an earthquake, what to do during an earthquake and what to do after an earthquake is critical. Please read the Emergency Preparedness for Earthquake from the US Embassy in Chile. The Embassy is on Facebook, Twitter, Flickr and YouTube (click the preceding links to check them out). Its Facebook and Twitter pages seem to have current updates (with Facebook 5 minutes ago, and Twitter 3 hours ago). To view some photos of the earthquake, check out Cryptome.